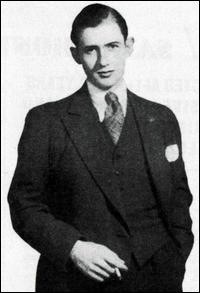 Patrick Hughes, who used ‘Spike’ as a professional name, is an intriguing figure who distinguished himself as a jazz musician in the early 1930s (there is a detailed discussion of his recordings by John Wright here) and later as a respected writer and broadcaster about classical music. During the 1960s and ’70s, he hosted Southern Television’s occasional opera broadcasts from Glyndebourne. 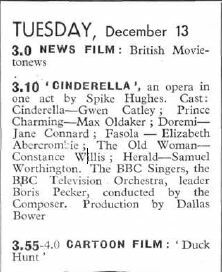 Cinderella was given at the start of 1938 on BBC radio, after which producer Dallas Bower – who acknowledged being ‘a close personal friend of the composer’ – sought to produce it for television (memo from Dallas Bower to Tel. Ex, 10 November 1938). Bower had a reputation for experimentation at Alexandra Palace and he set out to make Cinderella highly stylised and distinctive. For a short work to be shown first in an afternoon slot of 13 December (and then repeated eight days later), the production was also comparatively complex, requiring both studios at Alexandra Palace as well as film inserts. The role of Cinderella herself was sung by soprano Gwen Catley, then at the start of a successful career. In addition to the singers, there was also a ballet component with eight dancers, one of whom was the celebrated choreographer Antony Tudor. One of the productions which by mid-October 1938 was packed into the schedule of the Alexandra Palace studios was an ambitious original production of Cinderella as a pantomime. There is comparatively little documentation of the background to this presentation, but its scale (together with traces of some of the fall-out which are preserved in the files) indicates the increasing confidence of the television service more than two years after it had started again after the war. Such was the budget, indeed (£2,785 was allocated), that two repeat transmissions were considered, although in the event the live production (of which no recording exists) was presented only on 27 December 1948 and 4 January 1949. The cast of thirty (including eight extras) was led by the popular comic actor Jack Hulbert (as Buttons), who also co-produced with BBC producer Walton Anderson. Eric Robinson led a sixteen-piece orchestra, backing eighteen members of the George Mitchell Choir. There were also comparatively elaborate film inserts, with interiors shot at Lancaster House (whose administrators were concerned that the building should not be recognisable) and additional filming at Westminster Ice Rink and in Hatfield. Co-producers Jack Hulbert and Walton Anderson returned to Cinderella two years later. 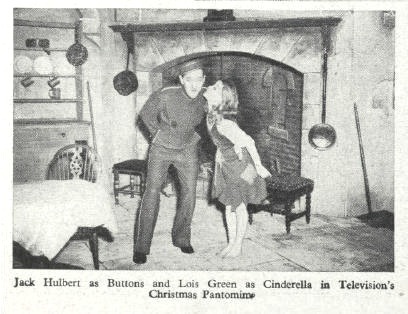 An original script (‘the book’) was written this time by Gordon Crier and Sally Ann Howes played Cinders. The pantomime horse appeared in the by-now familiar guise of the television favourite Muffin the Mule – no copyright fee was payable for this, but a verbal credit to the creators of Muffin was given in the programme. Most drama production had by this time transferred to the studios at Lime Grove, and live performances were scheduled for 26 December 1950 and 1 January 1951. Budget cuts, however, were a fact of life even then, and only £2,250 was allocated for this production, £585 less than the previous year. Even before what is referred to one memo as ‘the unfortunate accident’ it was clear that the budget was insufficient (memo from Ronald Waldman, 22 December 1950). Six Shetland ponies pulling a coach carrying ‘Cinderella’ – the actress Sally Ann Howes – bolted yesterday at Hatfield, Hertfordshire while being filmed […] Miss Howes was unhurt but the coachman, James Holt (73), of Greys, Essex, was taken to hospital. The BBC’s programme file on these post-war Cinderellas fails to record the fate of Mr. Holt but we must hope that he made a full recovery. This was the last of the four Cinderellas from the BBC during the six years of post-war Labour government, which would be voted out of office in October 1951. A fairy-tale ending was just around the corner with a consumer boom and years that Prime Minister Harold Macmillan, in a speech on 20 July 1957, could describe as a time when ‘most of our people have never had it so good’.